By Laura. Posted December 22, 2010 at 4:04 pm. Chanel Spring 2011 got me like woah. I got the Ombres Perlees palette, the JC, and the 2 glossimers, featured here. The swatches are indoors, as unfortunately it gets dark at like 3:30 nowadays and I never get enough sun-time in. 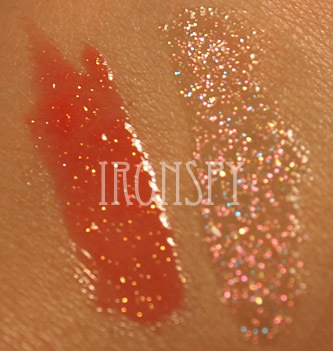 Though they are inside, the swatches are pretty accurate both color and shimmer-wise.